Father’s Day is right around the corner, and I know some of you fellow procrastinators have no idea how you’re going to celebrate the men in your life on their big day. Here are some ideas to help you out. 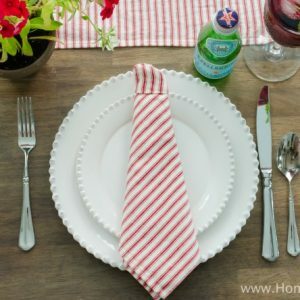 I am so glad that Mother’s Day isn’t defined by a skirt, but for whatever reason Father’s Day seems to be inevitably associated with the tie. This seems fitting for my own father but not at all for my hubby. He hates ties and goes to great lengths to avoid them. 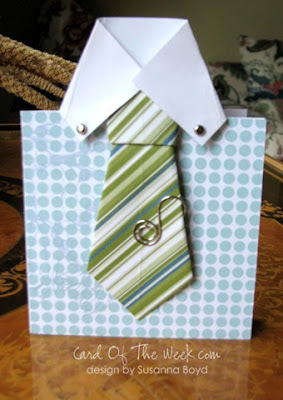 No matter, the tie seems to be the symbol of Father’s Day so many of these crafty ideas will include tie-themed ideas. Kendra from My Insanity suggests starting your celebration with a tie-themed banner welcoming your hubby into his day. Kids could easily help put this one together (although it probably wouldn’t look nearly as cute). How about using a squeeze bottle filled with pancake batter to outline a tie? 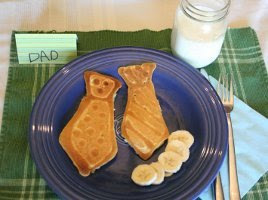 Fill in with batter once the outline has set-up a bit and you’ve got yourself some cute tie pancakes. How about making a tie card to continue the neck-choker theme? Check out this video tutorial for all the details. Is your guy more of a roughneck than a tie-neck? No problem. 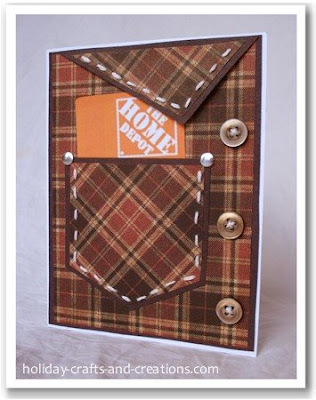 How about this cute make-it-yourself card that you can slip a Home Depot gift card into? If he’s more of a techy, how about making a nerdy shirt with pocket protector and Best Buy certificate? You could even slip a new iphone into this pocket if you’re a big spender! 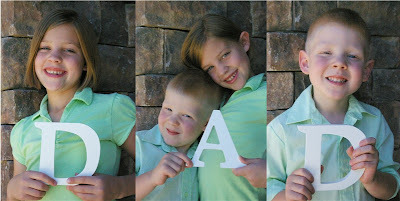 This next idea from the Brassy Apple is simple, inexpensive, and super cute. Buy or simply print and cut-out letters. Take some pics of the kids holding them and you’ve got yourself a great gift! You can use a picture software program to edit them together or you can simply buy a three-holed frame, print the pictures, and stick them in! Love it. How about this one for Grandpa? 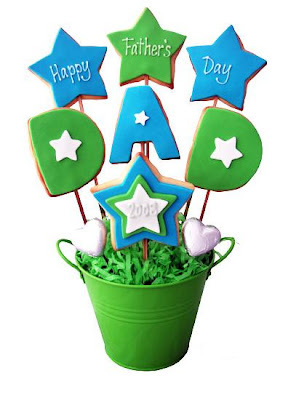 If you want to buy this cookie bouquet it will set you back $52. If you want to make it, my guess is that it will set you back about $5. Cute idea that could easily be replicated. Is your man a chocolate lover? How about making your own chocolate bar labels? I’ve talked about scrapblog.com before, and I bet you could make some very cute labels with their software. Too lazy for that? No problem. Go here, copy, paste, and print your own labels. 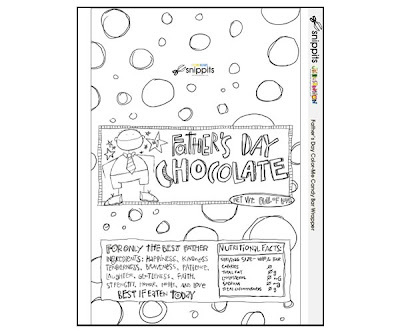 The kids can have fun coloring while you have fun making sure the chocolate is truly edible :). Just be sure you buy enough for the actual gift or you’ll just end up with cute labels. Not that I’m speaking from experience or anything! Do you have your own cute-worthy ideas to share? Pass them along in the comment section. Now that I’ve shared all these and my hubby reads my blog, I’ll have to think of something else. Hmmmm. Great. I am totally going to do at least 2 of these! If they work out well, I will post the finished results on my blog – ha! Loved the green and black room!